Whether you’re Irish or not, you can celebrate St. Patrick’s Day in some serious style this year. Get some “green-spiration” with these adorable green fashion items! We love Irish boys… and Italian boys… and yeah, you get it. But we also love this fun iPhone case from cafepress.com! Are you a T-shirt and jeans kind of gal? 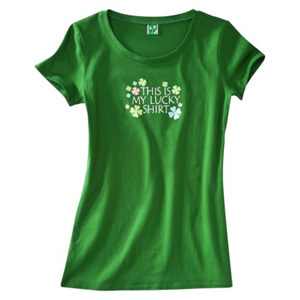 Rock this adorable four leaf clover t-shirt from Express to show your Irish pride this St. Patrick’s Day! Cheeky, fun and fashionable… just the way we like our T-shirts! Guess that’s why we’re obsessed with this St. Patrick’s Day inspired t-shirt from Target. Yeah, yeah, they’re sort of silly, but you have to admit that these green and white striped St. Patty’s Day stockings from Spencer’s are sort of awesome. Victoria’s Secret always seems to come out with the cutest holiday undies! Get a little cheeky this St. Patrick’s Day with these flirty shamrock bikinis!